India was down and out on the fifth day of the final Test of the series. But, Indian team is never short on surprises. And much so, KL Rahul and Rishabh Pant shot to the screen to rescue (to a greater extent) the Indian team from the deep waters of loss in the final Test of the series. 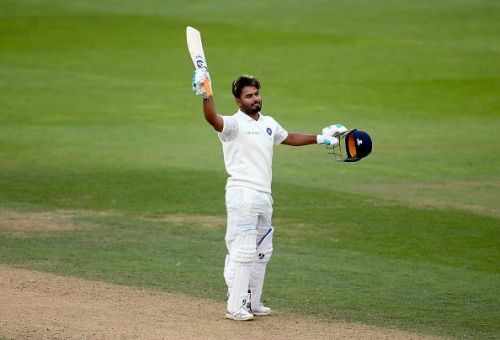 KL Rahul was spot on with his wide range of shots, and so was Pant who reached his maiden Test century. Having reached his maiden Test century in the final Test at The Oval, Pant inked his name in some of the unique records. He became the only Indian wicketkeeper to complete his debut Test century with a six. Pre Pant, there have been three Indian veterans who completed their debut Test hundred with a six. Thus, in this feature, we will have a look at four Indians including Pant who reached their respective maiden Test centuries with a six. Kapil Dev, the legendary Indian all-rounder, is perhaps the best all-rounder ever that India ever had in the history of cricket. His power hitting skills and exceptional bowling made him one of the best India cricketers of all time. Kapil Dev has had inked many records in the history books of Indian cricket. But, his book of records included some unique records as well. Interestingly, Kapil Dev became the first ever Indian cricketer to reach his maiden Test century with a six. Well, we unquestionably idolize Sehwag as the one who completed his Test centuries with a six, but it was Kapil Dev Nukhanj who started the trend. He achieved the feat in a Test against West Indies at Delhi in 1978. Irfan Pathan, another veteran Indian all-rounder, was one of the very few Indian cricketers to have a hat-trick in Tests. With his sumptuous swinging skills and more than an able batting hand, Irfan made himself a regular member in the Indian side. Irfan Pathan scored his maiden Test century against Pakistan at Bengaluru in 2007. Having completed his maiden Test century with a six, Pathan became the only second Indian player to achieve the feat of maiden Test century with a six.